You won't mind cooking in this wonderful kitchen! 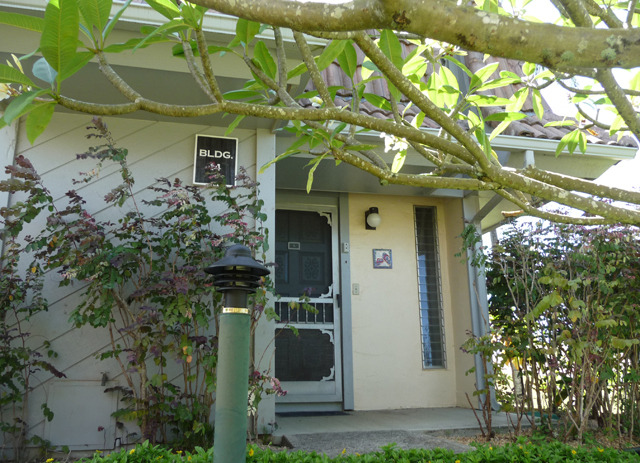 Your front door, your gateway to adventure! P’ani means play, sport, game, amusement. This is the perfect name for this well appointed condo on the 3rd hole & 4th tee of the Princeville Makai Lakes Course with its nearby trail to Anini Beach seen at left. We just started renting this for Allan after an extensive remodel. Allan tried to think of everything you & he might want on vaction. 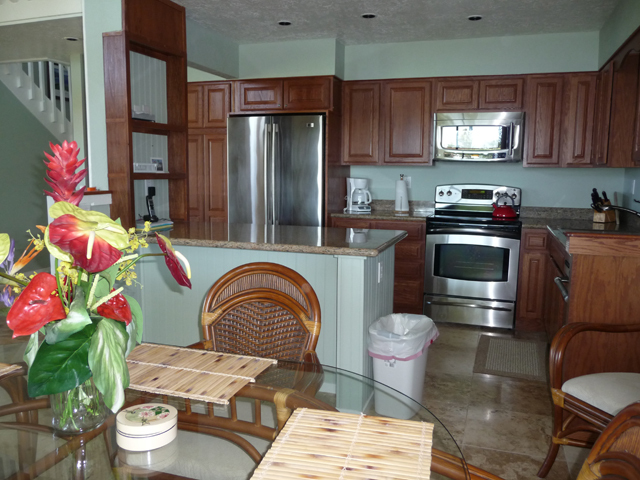 Since Pa'ani is just back into the vacation rental market, this lovely home may be available on short notice & holidays. This 2 bedroom, 2 bath condo with loft is in one of the best locations for enjoying all that the North Shore of Kauai has to offer. Not far into Princeville, so it is an easy exit to all the North Shore beaches. Just a 10 minute hike down to Anini. Pa'ani sleeps up to 6. This is an end unit, so you have windows on three sides. 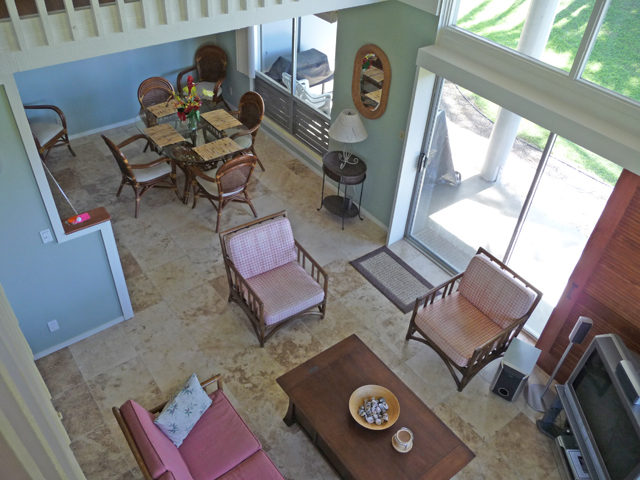 Pa'ani has a very open feel so you feel more like you are in home rather than a condo. 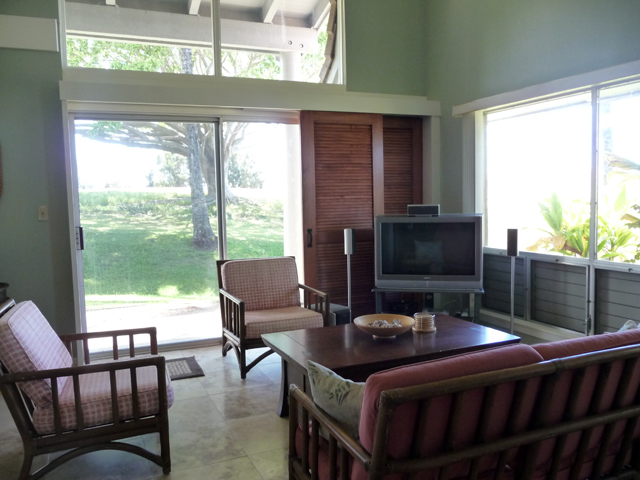 You can see the ocean from the deck & the living room as well as a couple of other places upstairs. Pa'ani has a well appointed kitchen, with all the gadgets you would expect plus some that you may not. There are coolers for the beach, and tupperware for picnics. There is also a gas BBQ on the deck. Even if you are not a golfer, you will love the openness that being on the golf course provides. There is a gorgeous old member of the ficus family between you and the fairway. It roots and branches change appearance throughout the day. If you are a golfer, well, this is a really cool spot to be (literally!). 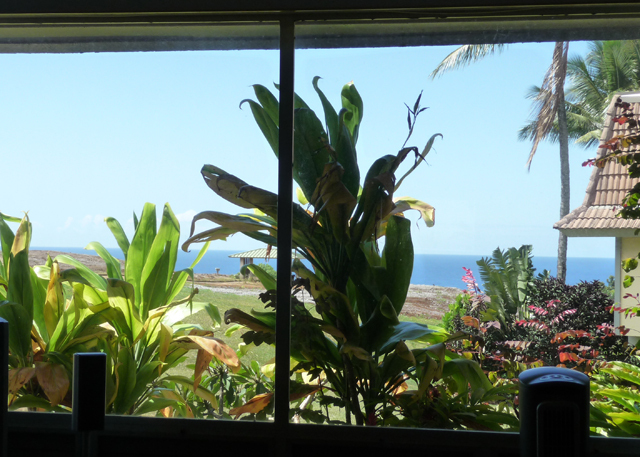 You can see the North Shore mountains from the dining room and the lanai. This shot is looking out of the dining room window, looking in the sunset direction. 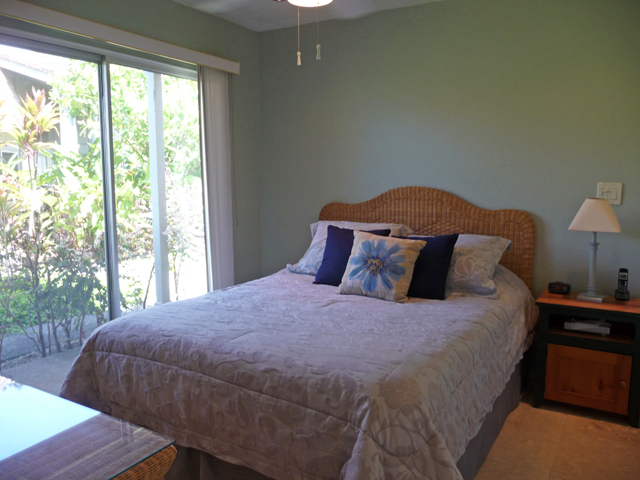 The master bedroom has a king size bed, TV & ample closet space. 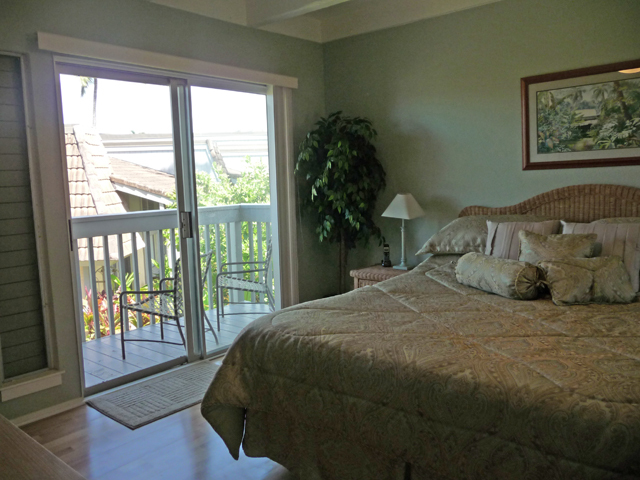 There is a small lanai off the bedroom that faces East for trade wind ventilation. You can see a slice of the ocean over the roofs & trees. You can also see the trail to the pool for Puamana. A key will be in Pa'ani for you to use. 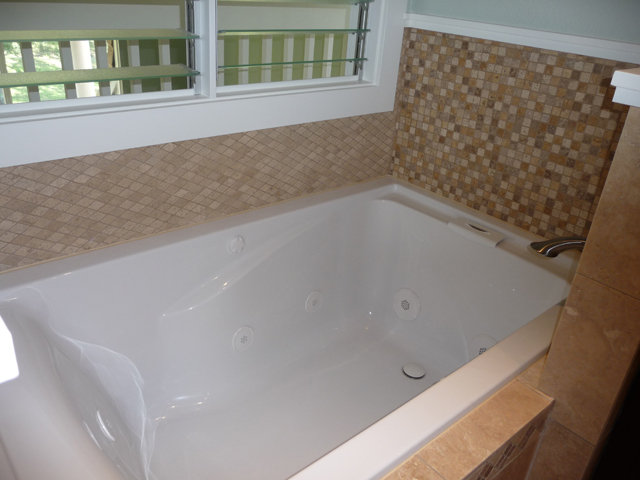 There is wonderful jetted tub in the master bath, so good for the muscles after a hard day of play. 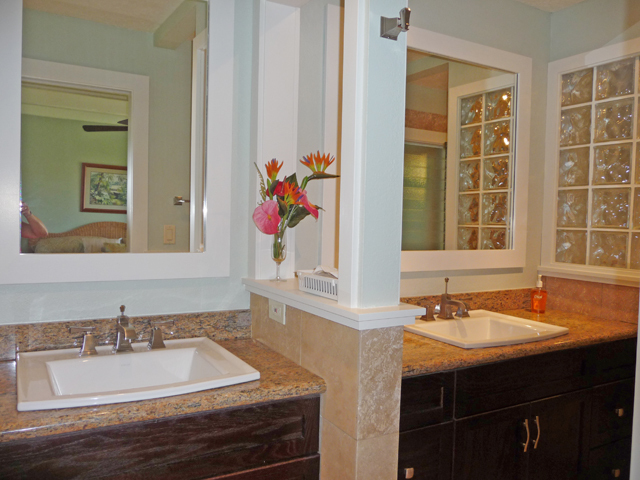 Separate his and her sinks give lots of room for you both. A tile stall shower with glass block rounds out the bathroom. The downstairs bedroom has a queen size bed, its own lanai, and a very nice bathroom with two sinks. 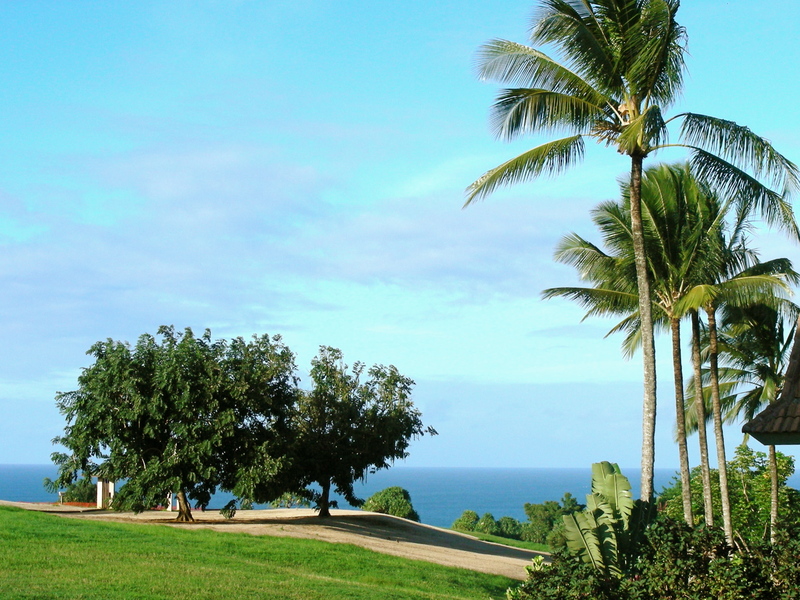 For this reason, Pa'ani is a great home for two couples to share. Of course there is a TV in this bedroom as well so it would be great for the kids. The loft with its queen size futon is another sleeping option. It is off the master bedroom. 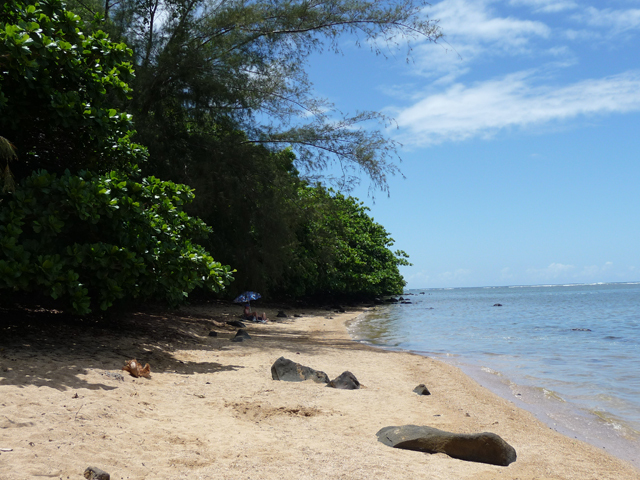 If you venture down the trail to Anini, this is your first peek at the water through the trees. I did this trail in June to take these photos. I went down and back in 30 minutes. Less than 10 minutes down, less than 20 up with breath & photo pauses, and long enough on the beach to snap some photos and promise myself to come back for the day. I hear the trail can be very slippery when it is wet though. You can see the tree lined trail below with a shot of Anini looking East from the end of the trail. The trail starts with a warning sign & a great Prince course view. Looking mauka, you can see the twin peaks of Hi'imanu mountain rising behind the albezia tree. check out 10 AM, follow instructions in the house. Flower picking garden in Paumana. Walking trails all over Princeville. Trail to Anini really close and trails to other beaches from Princeville. Princeville Health Club has daily weekly, monthly membership with a work out facility, pool, saunas and hot tub. Also offers different types of massage w/or without membership.